I have already dealt with the usage of prepositions in the posts Prepositions AT, IN and ON for time and Adjectives with prepositions. 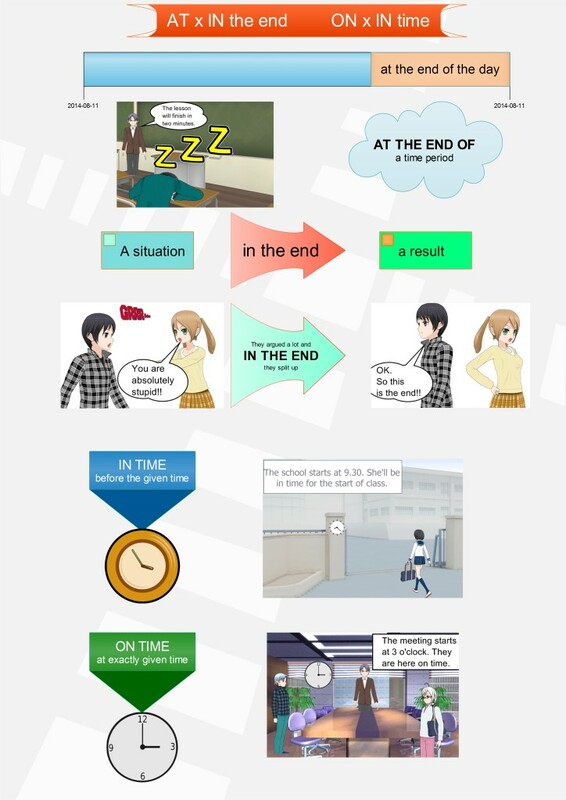 However, this post is different because it concentrates only on the phrases IN THE END, AT THE END, IN TIME and ON TIME which are frequently used incorrectly by students of English. In this post I would like to explain the usage and meaning of the phrases. To achieve this I have created a mind map, an interactive video and two quiz games. In this mind map I try to explain the meaning and the usage of the phrases IN THE END, AT THE END, IN TIME and ON TIME. If you feel that this explanation is not clear enough, there is a video explanation which can help you. In this interactive video you can see and here the explanation of the usage of the phrases. The video contains many questions which you have to answer to move on. In this way you can check immediately whether you understand the phrases and use them correctly. The video is in HTML5 so it will play on your mobile device too. Now, I hope, you understand the usage and meaning of the phrases IN THE END, AT THE END, IN TIME and ON TIME. So do not hesitate to try out our interactive exercises and games. The first game is in HTML5 and it will play on any mobile device. Your task is to complete the quiz with the correct phrases and if you pass you will be given a chance to play the game Word boggle (really great addictive game which might help you improve your English a lot). The second game will play only on your desktop. It is called Hoopshoot and your task is to choose the correct answer and then score. Good luck. hey i’m hamza a student at electrical engineering i want learn english language at british council in algeria. what should i do? I must confess this has been a good way to learn something… despite the fact that sometime there were mistakes, I have learned now to put the correct expression when it is requiered…. Nice to see that i wanna join to british council.